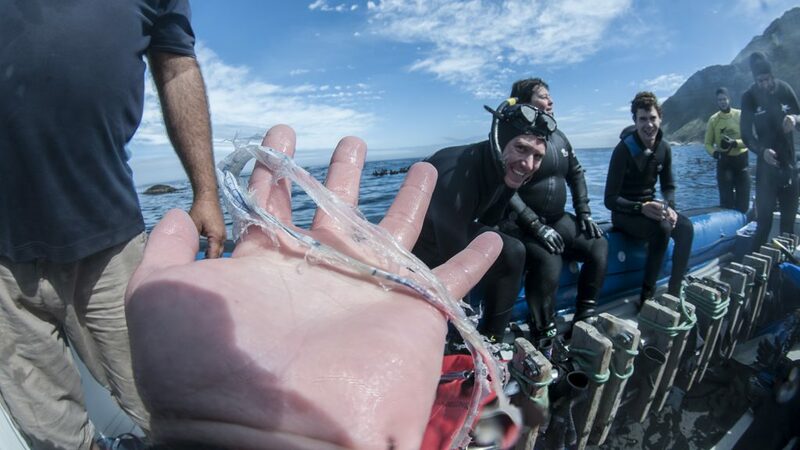 We recently found a Cape Fur seal pup, born at Duiker Island, Hout Bay, with a piece of plastic around its neck ! This little Fur seal is only 5 months old and it already being affected by our litter. 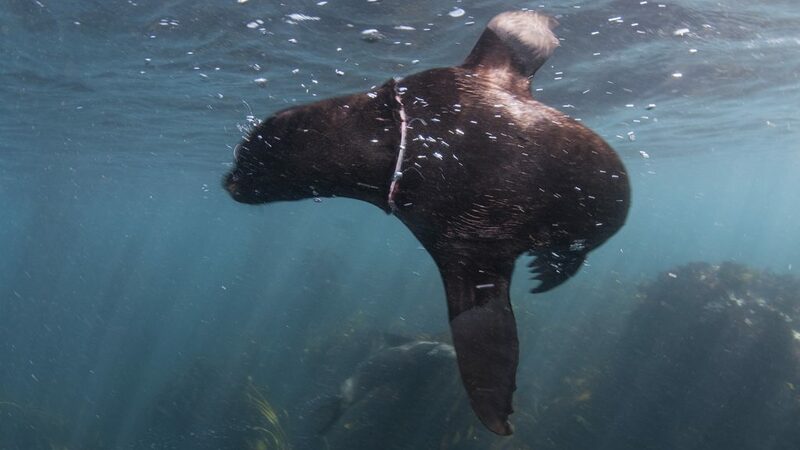 Plastic in our oceans is a MASSIVE problem and we see it everyday on the seal snorkeling trips of Animal Ocean. 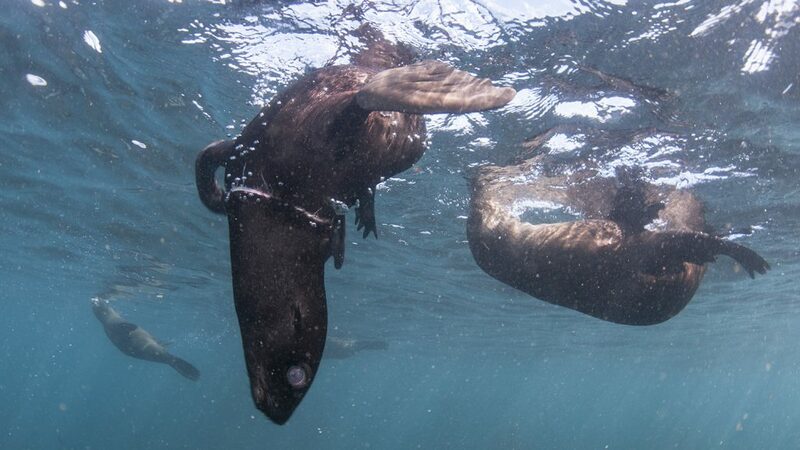 This is a sad reality faced by the Cape fur seals in Hout Bay, as in many harbours and ports around the world – becoming entangled in fishing line or pieces of plastic, which cut into the skin as the seal grows. It is incredibly difficult to help once this has happened, as the Fur seals either hop into the water and slip away when approached on land, or zoot and zoom past in the water and cannot be caught. Yesterday Steve managed to catch this little one, the younger ones tend to be more curious in the water. This was no easy task, he stalked the little pup until it took an interest in his camera. The pup turned to swim away and came just close enough on the turn for him to reach out and grab a hind flipper. After that a wrestling match occurred, with Steve hugging the seal pup and dragging the biting, frightened Fur seal the boat. Here we were able to remove the plastic caught around its body. A difficult task with a youngster, made even more tricky as they grow older and the noose becomes tighter. This is a stark reminder of the effect that human behaviour has on marine wildlife – please have a think about the long term impact of the products you purchase and consume, and what happens to the packaging often carelessly discarded. Thank you Steve and Dave for helping this tiny seal out! Swim free little seal. This is not the first time we have rescued Fur seal pups, in fact we help them out quite regularly. Below are two videos of past rescues that Steve and Animal Ocean have done. Check out more videos on our Youtube Channel.